Do you ever want to buy a game and your partner doesn't think you should - are you sure this is our kind of game? To be honest, if you look at our game collect I'm not sure I could tell you what our kind of game is, we buy games from all different genres with all types of mechanics. So why was he unsure about this one? Well, to start with the art is a little cartoony and on first glance seems simplistic - in fact the guy we bought it from said he was selling it because his kids thought it was too easy... Despite these first thoughts it still ended up on our 10x10 and it was the first game that we have managed to play 10 rounds of this year. Three of the six workers. Building components for all three levels (and tops). While we love the gameplay, the components are what make this game. The game board for this is a unique board that sits up above the table to give it the 3D look and once the buildings have been put in place the game looks great on the table. While the board may seem a little excessive, it adds a great effect when playing and makes it easy to change viewpoints when you are looking for a Hail Mary move. The building components don't look like much when you are unpacking them, but when the game is done and you see the city you built boy do they look great! The miniatures are nicely detailed and look great when painted. As Cody originally pointed out, the artwork is a bit cartoony which isn't everyone's cup of tea, but I personally love it. It brings the god cards to life and makes an abstract game a little more friendly looking. Santorini is an abstract game with a beautiful 3-D layout. 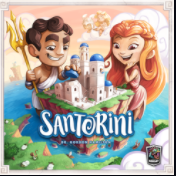 The game is themed around Greek Gods and building the city of Santorini. This game does not score victory points but instead the first player to place their worker on the top of a fully built tower wins. In the base game each turn consists of a move and a build phase. The player will move their worker one space in any direction, providing they don't move more than a single level up, and then build up in an adjacent space. Players may block an opponents victory by placing the blue cap on the top of the third level, stopping them from placing their worker on the third level and claiming victory. The game also comes with two sets of god cards (easy and hard), this provide special move, build, or win conditions for the player. There is also an expansion The Golden Fleece that provides more hero cards with new powers if you get bored with the initial god cards. One of the downsides to this game are that if you draw god powers that are greatly uneven the game can be a little one-sided. What we do is keep drawing until we have gods with the same symbol. Although we have not played this game with more than two players, the gameplay for four players seems like it would be a little clunky/challenging. This is one of our favorite games to play, requires very little set up. You can go from box to playing in less than five minutes which is part of the reason it was included in this year's 10X10. If you want a quick and easy game that doesn't take long to play but can really make you think this is a game you should check out!